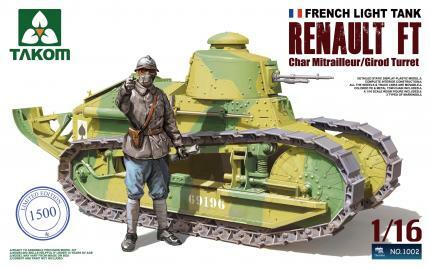 TAK161002 - 1/16 Renault FT-17 French Light Tank Model with 8mm Machine Gun and Girod turret. This kit includes a complete interior with engine and transmission. Moveable individual track links along with moveable road wheels. PE set and metal tow chain. 1:16 scale resin French tanker figure. Decals for 3 tanks. Please Note: The last picture shown is a test shot of the finished model. The final production kit may vary from this picture.